Poka-Yio is an artist and curator, based in Athen. Together with Stefanie Hessler and Kostis Stafylakis he curates the current 6th Athens Biennale ANTI. 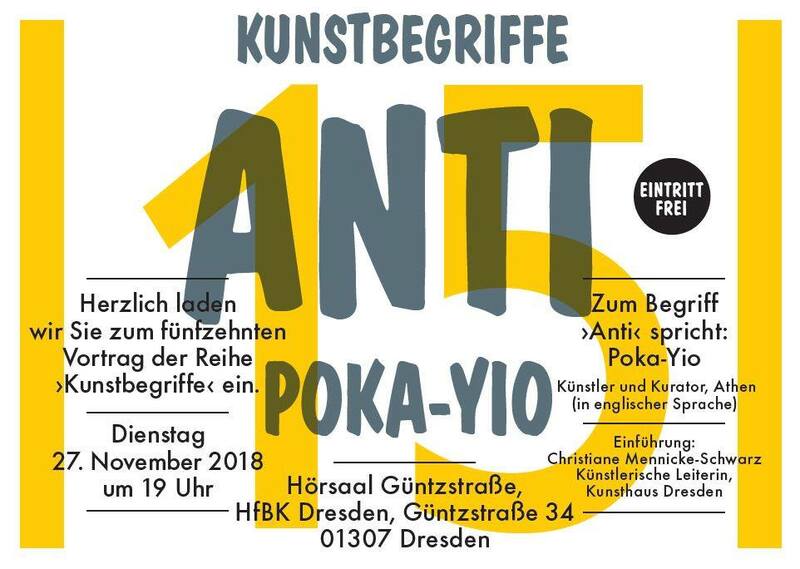 This edition of the Biennial, which Poka-Yio also co-founded in the year 2005, is dedicated to the (in) possibility of oppositional action and highlights the antagonism of resistant attitudes between marginality and the new mainstream. The Athens Biennale has been honored by the European Cultural Foundation for its open collective curatorial model. Poka-Yio’s artistic work is in the field of installation and action art. In 1999, he founded A-Station, the Athens Center for Contemporary Art, which he directed until 2014. The series of lectures Kunstbegriffe was initiated by the Kunsthaus Dresden in collaboration with Landesverband Bildende Kunst Sachsen e.V. and the Dresden Academy of Fine Arts as well as the Art Fund of the Free State of Saxony / Staatliche Kunstsammlungen Dresden. Those responsible for the idea and conception of the lecture series: Lydia Hempel (Landesverband Bildende Kunst Sachsen e.V. ), Christiane Mennicke-Schwarz (Kunsthaus Dresden - Städtische Galerie für Gegenwartskunst) and Prof. Dr. Marion Hilliges (Dresden Academy of Fine Arts). Kunstbegriffe is a lecture series in cooperation with: Landesverband Bildende Kunst Sachsen e.V., the Art Fund of the Free State of Saxony - Staatliche Kunstsammlungen Dresden, Kunsthaus Dresden – Städtische Galerie für Gegenwartskunst, Dresden Academy of Fine Arts. The lecture will take place in the series "Kunstbegriffe" as well as within the initiative for contemporary art "The balancing act between local and global action" sponsored by the Capital of Culture Office of the City of Dresden.